Most young people ages 25 or younger have no idea what a mail order catalog is. I cannot blame them—in the age of the Internet there is really no need for waiting in the mail for a printed catalog when you can instantly explore and buy from a business on the Internet. By advertising on the Internet a business also saves a ton of money by not having to print a catalog. I can understand the logic of this—not needing to print a catalog removes a lot of overhead. It also saves time—orders can be placed online and this means the customer can get things much faster than would be possible by sending in an order by ordinary post. For those of us who can remember what a printed mail order catalog feels like (and even looks like since many young people have literally never seen one! ), it has an aura all its own. Unlike an electronic image a catalog is something you can hold in your hand. You can see the beautiful color photos of things being advertised. 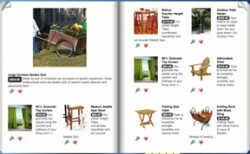 A catalog is something you can take out and put away anytime you wish. One can spend hours again and again looking at what is all in the mail order catalog. Sure, catalogs have become smaller than they were 30 to 40 years ago, but they still hold a great deal of fascination for those of us who remember them. The mail order catalog is almost as old as America itself. It is said that the first mail order catalog was created by none other than Benjamin Franklin who put together a mail order catalog for science and philosophy books he wanted to sell. The first known mail order catalog was put together By the company Hammacher Schlemmer in 1848. In the 20th Century mail order catalogs became not only popular but an everyday staple of life. The Sears company started out mass mailings of its ever popular catalog the Wish List. I remember the Sears mail order catalog when one could buy just about everything from clothes and gas grills to toys and Christmas decorations. During the 1940’s and early 1950’s it was possible to buy the materials to put together a full-scale house! Mail order catalogs remained popular until the 1990’s, when the Internet became the mode of choice for business. Also, putting together a catalog has become much harder. Paper, ink and getting catalogs put together has become cost prohibitive. For most businesses today the Internet has become the means of choice. Catalogs that are being sent out today are more like advertising instruments to complement a business website than act as a main medium of display. Interestingly enough, mail order catalogs are still preferred by a few businesses because they know the Internet is not entirely widespread in a number of isolated regions of the country (especially if the communities in question have no computers), and mail may be the only means of communication for some isolated communities. There are far fewer mail order catalogs these days than in my time. However, they are not on their way out yet. Unlike analog television, the mail order catalog will still be with us for some time.